Here at A Jour we are working with a new, state of the art, very exiting system called GemVision MATRIX, a CAD system. "Old" traditional goldsmith know-how and techniques are supported and combined with cutting edge modern technology. Coming from the bench it is like growing a third arm,... I love it, even though I am a traditional "benchy". It is amazing what the combination of old school and modern technology can accomplish. 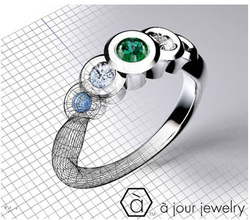 We are literally finding new frontiers in the jewelry world. You tell me about your wishes, desires and ideas. I take notes, make little hand drawn sketches and present you a few days later with a photo realistic picture of your dream piece. This new way takes the uncertainty out of the ordering process. You know precisely what I am making for you, no surprises and no disappointing revelations. Many customers used to shy away from the one of a kind piece because of the difficulty visualizing a finished piece of jewelry from a sketch. Even a colored hand drawn render was often met with unease. An understandable hesitation considering the money involved in such a project. Committing was not easy. My new process makes this decision actually fun and exiting, my customers now can’t wait to get their pieces, the real deal.